Like many roles in the C-Suite, the CIO role is changing. Its impact and control have been circumvented by cloud computing, the consumerization of IT, and employees’ unprecedented access to technology. The role of the CIO is at a critical juncture. 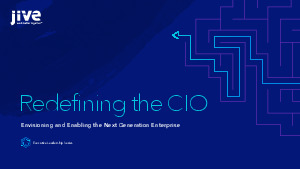 In this exclusive Jive e-book, industry analyst Brian Vellmure takes a deep dive into the challenges and opportunities facing today’s CIO.